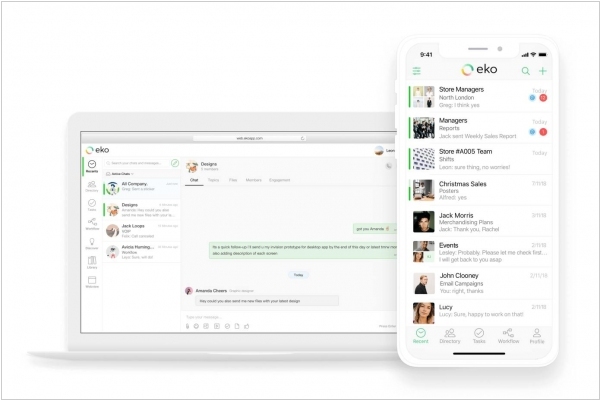 Enterprise messaging platform Eko is getting ready to take on Slack, Microsoft Teams and other enterprise messaging apps in Europe. The startup announced today that it has raised a Series B of $20 million and opened offices in London (which will serve as its new commercial headquarters), Amsterdam and Berlin. The company claims that its revenues have more than tripled in the past year and that it now has more than 500,000 recurring paid users. Of course, any enterprise messaging startup has to contend with the specter of Slack and Microsoft Teams. Positioning Eko Communications as a rival to those services, however, isn’t totally accurate, because they are aimed at different customers. Many employees in those sectors still rely on messaging apps like WhatsApp or email to communicate, so Eko Communications seeks to make it easy for companies to transition from their ad hoc communication methods to a more secure and efficient system with tools like APIs to help them integrate legacy systems. Microsoft announced that its new groupchat Teams will become its core communications platform for users running Office 365. Until now, Skype for Business was the company’s product for this. According to Ron Markezich, the company’s corporate VP for Office 365, Teams will become the “hero and primary experience for all voice, video and meetings.” Over time, Teams will replace the current Skype for Business client. Microsoft obviously knows that enterprises don’t move fast, so for those who don’t want to do away with their existing PBX systems and calling capabilities to the cloud, it’ll launch a new version of the Skype for Business server in 2018. For those who do make the transition to Teams, Microsoft promises lots of new calling features and meeting enhancements with outbound and inbound calls to and from regular phones, support for voicemail, call holding, call transfers and other standard telephony features. 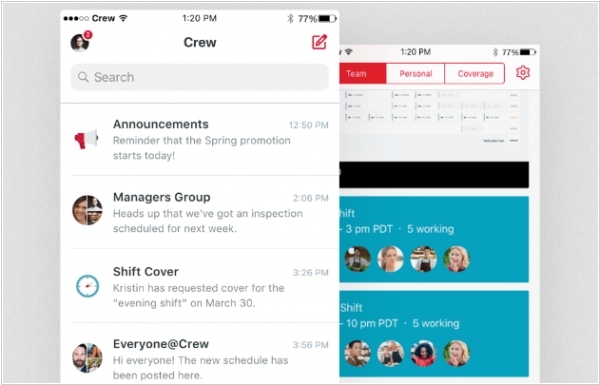 Enterprise messaging service Slack is raising a $250 million round at a $5 billion valuation. Slack has almost a cult following in Silicon Valley, but much of its success will be contingent on whether it is able to convince large enterprises around the world to switch services. Slack has touted itself as an alternative to email, but it’s not a platform for communicating with people outside your company. A lot of people love Slack over other alternatives for its modern interface. In the beginning of the year Microsoft wanted to acquire super-popular group chat software Slack, but then decided to build the same own service from the scratch. 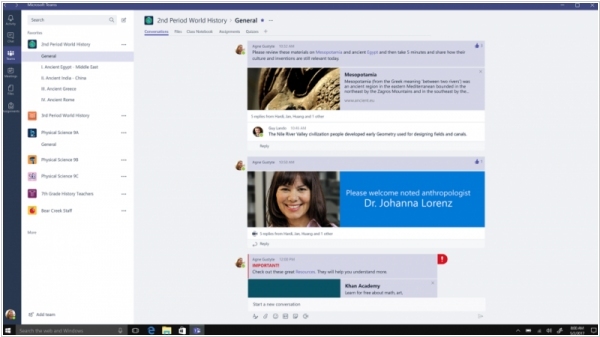 And here it is - Microsoft Teams, and it looks very similar to Slack. You can create rooms for projects or departments, communicate from desktop or mobile devices and share files and other content. 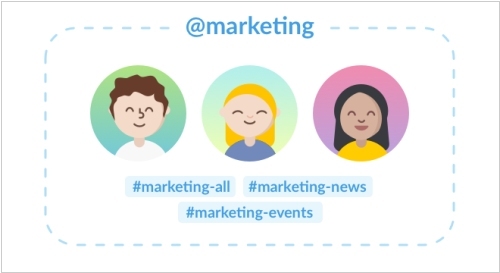 Like Slack, it features bots for notification and auto-replies. The main advantages of Teams (according to Microsoft) are its security and tight integration with other Microsoft applications, like Skype, Word, SharePoint, Planner and OneNote. Teams will be available for free in business subscription plans of Office 365. So Microsoft hopes that it will become the last straw for those companies that still don't use Office 365. Teams is now in preview mode and will be generally available in early 2017. 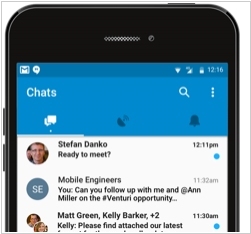 Symphony, the enterprise messaging app, is adding new voice, video and screen sharing features in the form of a new product called Symphony Meetings, and it is also launching the Symphony Webhooks API, giving companies the ability to create their own integrations with third-party apps alongside a list of apps that Symphony itself is integrating from Salesforce, Github, JIRA, Trello and Zapier. 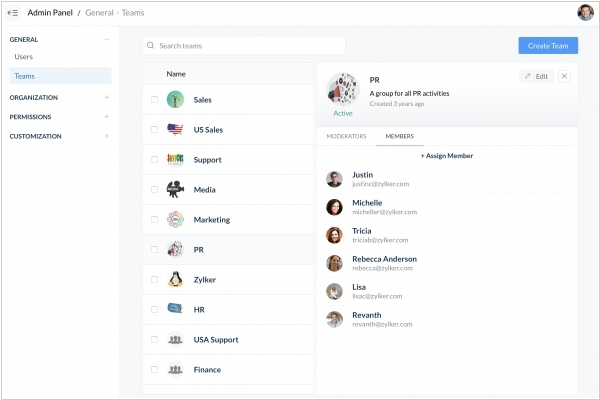 Unlike Slack, Microsoft’s Yammer, Hipchat Symphony is directing its own product not so much as a general enterprise app, but it takes some of the consumerization trend that helped form those other apps and is applying it specifically to the finance vertical. 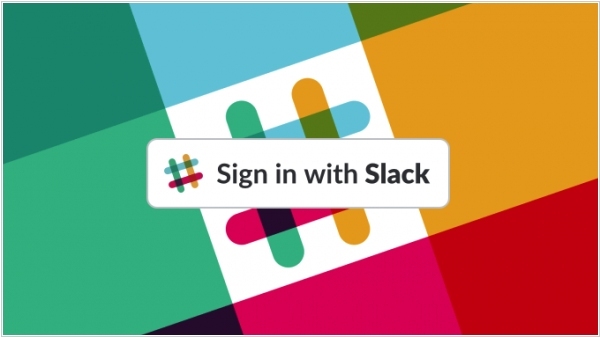 Slack is looking to enhance the experience of how larger organizations function through the introduction of User Groups. The new feature allows notifications to be specifically sent to separate departments. Whether it’s getting the message out to a company’s engineers, customer service teams or marketing teams, user groups allows entire groups to be alerted about issues in a moments notice. Initiatives like this fit into Slack’s larger focus of allowing the platform to operate more effectively for larger organizations. In turn, this feature will only be enabled for Slack teams on paid plans. 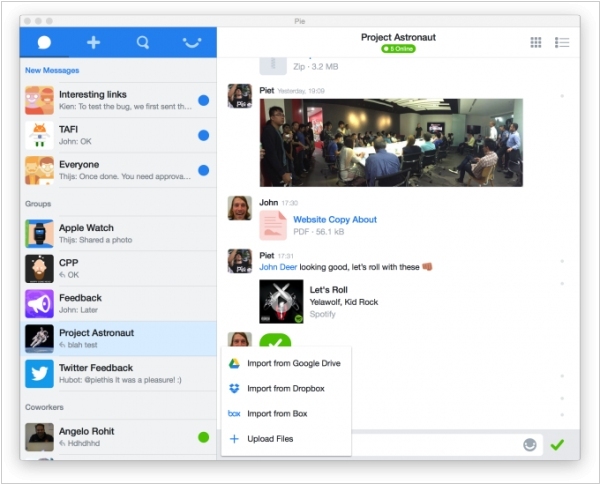 Enterprise messaging service Pie has raised a $1.2 million Series A round as it prepares to monetize its service. Pie is a messaging service for teams with apps across iOS, Android, Mac and the web, and integrations with Dropbox, Google Drive, Box and others. It’s much like a simplified version of Slack. With no paid promotion, the app is being used by over 2,000 companies, from obvious verticals like marketing, advertising and publishing, to less likely customers including flower shops, manufacturing plants, universities, and even churches. With new funding in the bag, the company is preparing to introduce a paid version of this app, which will include admin controls and cost $3.14159 per user per month. 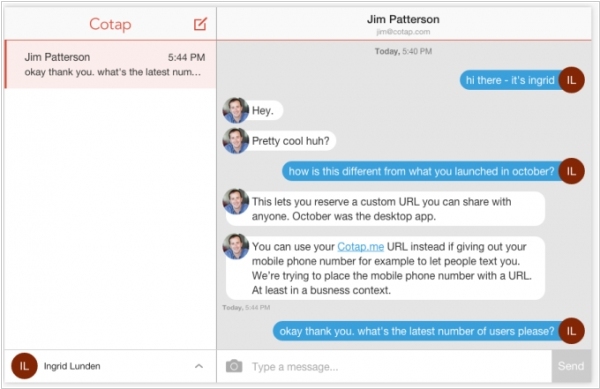 Cotap, that bills itself as a "WhatsApp for the workplace", has launched a new feature to expand the circle of people who use the app: it now lets others send messages to those users via a URL on Cotap.me, without having to download the app itself. It comes on the heels of a desktop app launch for the product in October that used some of the same functionality for Cotap-using work colleagues to communicate with each other when they were not on their mobile devices but at computers. Today’s launch effectively lets anyone use the chat functionality of the app, by way of the custom URLs that individuals give out. Adding a web component to the app means that those who are Cotap users for work can now share their Cotap IDs with other people — as they would, say, a Skype or email address or mobile number in their email signatures or business cards — as a contact ID for anyone.